KABUL, Afghanistan (AP) -- Hundreds of millions of dollars from Kabul Bank were spirited out of Afghanistan — some smuggled in airline food trays — to bank accounts in more than two dozen countries, according to an independent review released on Wednesday about massive fraud that led to the collapse of the nation's largest financial institution. The report, which was financed by international donors, offers new details about how the men at Kabul Bank and their friends and relatives got rich off $861 million in fraudulent loans in what the International Monetary Fund has called a Ponzi scheme that used customer deposits and operated under nascent banking oversight in the war-torn country. The report describes Kabul Bank as a sophisticated operation with one set of books for the eyes of regulators and another in the back room that logged how those running the bank and others were fattening their wallets. Loans were made, but rarely repaid. Borrowers took out loans to pay back loans. Company documents and financial statements were fabricated. The bank's credit department used more than 100 corporate stamps for fake companies to make documents look authentic. The bank operated some of its more than 100 branches without a permit from the government. The 87-page report, which was conducted to satisfy one of several benchmarks the IMF asked the Afghan government to meet in cleaning up the scandal, points to poor oversight by Afghan banking regulators, political interference in the criminal investigation and activities by a special judicial tribunal hearing the case that it said were "well outside the legal norms of criminal procedure." The bank's failure and subsequent bailout represents more than 5 percent of Afghanistan's gross domestic product, making it "one of the largest banking failures in the world," according to the report by the Independent Joint Anti-Corruption Monitoring and Evaluation Committee. The report said "hundreds of millions" were sent out of the impoverished nation where Afghan, U.S. and NATO forces are fighting an 11-year-old war with the Taliban and other militants. "Every citizen in Afghanistan will bear the cost of the hundreds of millions of dollars required to secure deposits and the tens of millions of dollars required to deal with the aftermath," the report said. "This is real money from the annual budget of the government that could be much better spent on other priorities, such as education, health care, infrastructure or security." The Kabul Bank scandal is a saga about money-grabbing, weak banking oversight, lax prosecution, nepotism, political contributions and fraud. The cast of characters includes a poker-playing bank chairman, an Afghan central bank chairman who feared his life was endangered and fled to the U.S., the wealthy brothers of the Afghan president and vice president, and bank shareholders — some who bought posh properties in Dubai and spent lavishly on themselves and their circle of friends and relatives. President Hamid Karzai announced in April 2011 that Kabul Bank would be put into receivership. Earlier this month, a trial began for more than 20 people indicted in the debacle, which has become a symbol of the country's deep-rooted corruption and cronyism. The case is being closely followed by Afghans and international donors because it is a barometer of government officials' pledge to root out patronage, graft and show accountability to international donors. The report said Afghan authorities learned in late 2009 that "Kabul Bank was moving money through food trays" on flights operated by Pamir Airways, a multimillion-dollar Afghan airline that was established with loans from the bank and has since gone out of business. An official knowledgeable about the report said as much as $900 million — a majority derived from loan schemes — was moved out of the country through electronic transfers between March 2007 and April 2011. That money, the official said, ended up in bank accounts in 28 countries, including the United Arab Emirates, Latvia, China, Turkmenistan, Britain, Kazakhstan, South Korea, Turkey, Russia, the United States and Switzerland. The official spoke on condition of anonymity because he was not authorized to disclose the information, which was not included in the report. According to the report, 10 Pamir Airways pilots were paid $320,000 in salaries between March 2008 and November 2010 under the description of "pilots of cash delivery." The report said the Afghan attorney general's office recently asked for international assistance in tracking the funds abroad but the request was limited to help from four countries — Switzerland, France, Britain and India — for information on funds tied to the former top two bank executives. The report also criticizes the attorney general's office for not undertaking a substantial probe into the bank until April 2011 — a year after the news of the bank's problems surfaced, eight months after nervous customers ran to withdraw deposits and five months after the central bank had asked the attorney general's office to start a criminal investigation. The indictment names more than 20 bank executives, bank employees, central bank workers and others who allegedly benefited from the fraud. The charges include money laundering, misuse of authority, using counterfeit documents and opening accounts under pseudonyms. But the report claims the indictment is tainted by political influence. "Information received during the inquiry indicates that the final decision about who to indict was made at the political level in the spring of 2011 by a high-ranking committee — and that prosecutors from the attorney general's office were called in to amend the indictment to conform to the decisions taken," the report said. Basir Azizi, a spokesman for the attorney general's office, said Tuesday that the Kabul Bank case was not treated as a political issue. "We strongly reject any comments that the attorney general's office dealt with this case as a political issue," he said. The committee also is critical of the special tribunal that Karzai created to hear the case. The report said the tribunal has had off-the-record meetings with accused individuals and potential witnesses, has conducted its own probes on the sidelines and has held meetings with shareholders, urging them to repay money — a job tasked to the receivership. As of Oct. 31, the receivership has recovered $135.3 million in cash as well as assets with a book value of $181.1 million, according to the committee. The report gives the Afghan central bank credit for carrying out various examinations of the bank, saying it tried to take enforcement measures or corrective actions four times after consistently spotting regulatory violations. But the committee said that unless the central bank and other Afghan institutions move to operate independently, stand up to political interference and hold wrongdoers accountable, the Afghan government will never be able to sustain a fully functioning democracy. The report said $861 million, or 92 percent of Kabul Bank's loan book, went to 19 individuals and companies. Among them are key bank shareholders, including Sherkhan Farnood, the former bank chairman and a world-class poker player, former chief executive officer Khalilullah Ferozi, and the brothers of Karzai and first Vice President Mohammad Qasim Fahim. In 2009, the central bank advised Afghan banks to refrain from making political contributions in the presidential campaign. 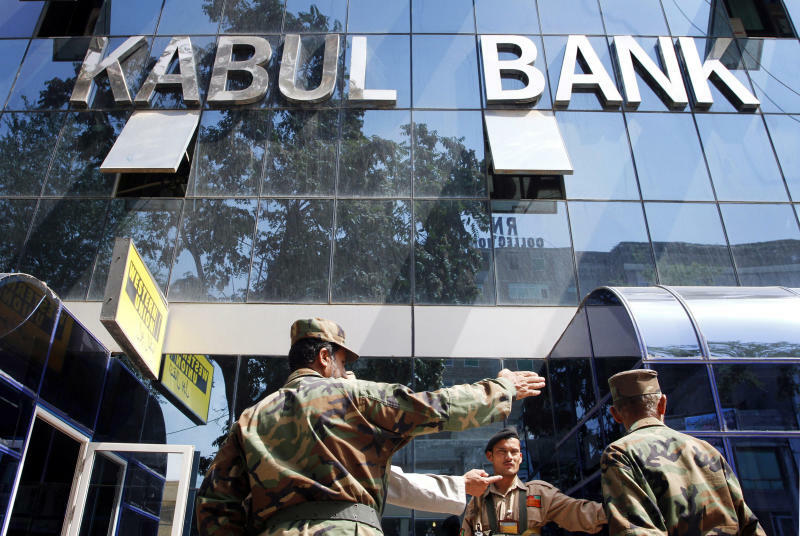 "This letter was not enough to dissuade Kabul Bank, which reportedly provided millions of dollars to the campaign of at least one presidential candidate — in addition to dozens of cars, and payment of the entire media campaign including billboards and television advertisements," the report said.